A fledgling community action group is getting down to ‘business’ with a strategic planning day on July 2, piecing together a plan of action on the vexed matter of the proposed north-west rail link. Based on its proactive stance during the NSW election in March, north-west Sydney-based Hills Transport Working Group has grown its subscriber numbers from 150 to over 1000 since forming in mid-2010. "We are not a group who will form our own opinions and tell people what to think," Hills Transport Working Group Chairman James Fiander says. "We are a member based organisation so its about being strategic about what we do, approaching government and organisations to elicit the outcomes for transport, rather than waiting to react every time." Fiander says the group has high hopes for what the new government can deliver for Sydney’s north-west. "It does seem from initial reaction to transport policy that the north-west Hills district is a priority for the new government, and that’s very encouraging," he says. "At the moment the feedback we’ve had is that most people in the Hills district are not seeing the proposed north-west rail link as the be all and end all solution." Fiander says the group would likely push for an integrated transport system, not just about trains, considering the network of buses required to access proposed new train stations. "It would be lovely if a train station ended in every person’s street, but we understand that residents will live up to five kilometres from a bus station and there’s not going to be 300,000 car parking spaces at the train station," he says. The Hills district population is currently 300,000 which Fiander says will almost double over the next twenty years, placing further pressure on public transport across rail and bus modes. Given that a north-west rail line is probable, Fiander questions how a bus network to feed the rail line is going to work. "At the moment, people who do take a bus catch two buses, a feeder bus to a T-way stop for an express bus down the M2 into the city or north shore," Fiander says. "The local bus service isn’t fantastic because the focus has always been on the trunk routes, so a lot of people already drive kilometres to a bus stop and park nearby." He says this places pressures on existing bus commuter car parks, such as the Riley T-way on Windsor Road which has parking for about 700 with 1000 people trying to get in to park. "We are encouraged by the recent tender for the north-west rail link saying there will be an additional 3000 car parks," he says. "But that’s just one dimension to get people to the rail line." Once a rail line is established, Fiander says his group would likely recommend existing bus funding to be re-distributed to improve rail feeder bus services. Fiander says the July 2 meeting won’t focus solely on the north-west rail line proposal. 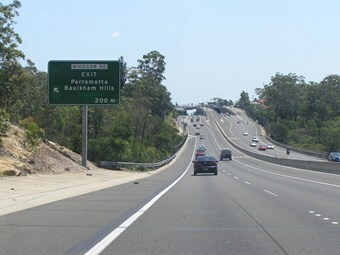 A bus-related action identified by the group is to introduce the Public Transport Information and Priority System (PTIPS) currently in operation along Parramatta Road and other major arterial roads outside of the Hills area. Fiander says many Hills district group members had suggested by survey to roll the PTIPS system into their area. The district is serviced by Hills Bus, Westbus and Busways, each invited to attend the Group’s planning day on July 2, but with strict caveats. "We are willing for operators to come along and listen, but the planning day is meant to engage the community and our subscribers." The Hills Transport Working Group strategic planning day starts at 10am on Saturday July 2, at the Rouse Hill Town Centre with lunch provided. Contact info@myhillstransport.com before Friday June 24 to RSVP.